Several weeks ago I visited Long Island City to visit S. E. Nash. Check her website, linked above, for even better images of her worlds within worlds, constructed from sintra, which resembles paper, but is more solid. (I've just rechecked the link and to my horror, found it did not work. In case it continues not to, the site is senash.com). I also visited Thomas Martin, whose quirky marker drawings you can see at http://thomas-martin.org. 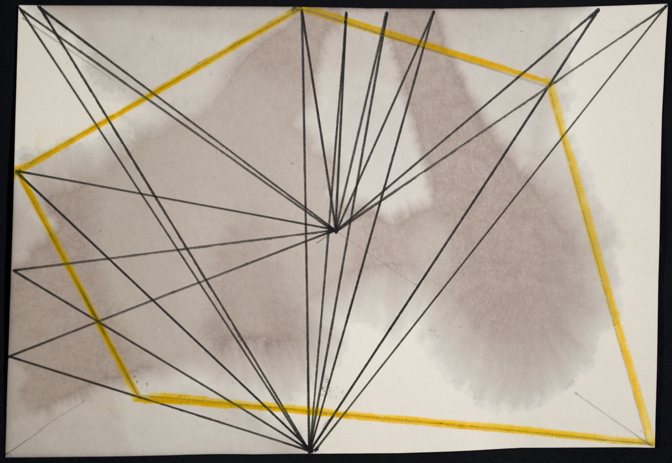 He works small, repeating shapes, and moving back into them with collage-like elements (lines or planes). Thomas has worked with D. Rockburne, and you can see this influence combined with his curiosity about structure. 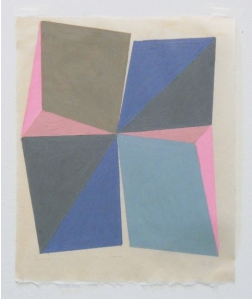 His collages led me to think about Lisa Hamilton's geometric and folded works on paper from 2010, which you can see here: http://lisahamilton.net. Since I've last seen her work she has taken this concept and run with it in longer, serial formats. Pure magic: color as space. Wall looks pink, but color seems true-r in painting. Li SongSong at Pace Gallery, 25th St.
Japanese wood block prints...gorgeous ceramics...mixed with contemporary art. This gallery is mounting some memorable shows! "Vivid" and "Pavers" from 2010--and now this! Truly a museum quality exhibition--what I am showing here is a mere taste of what is in the gallery. "Painting Expanded" at Tanya Bonakdar. Knit painting. Better color than portrayed here. Josh Faught. Find the fingernail in the pink field of bloom. Below, Terry Winters at Matthew Marks, 1980s but timely in the revival of lush and painterly paint. Look at the color! 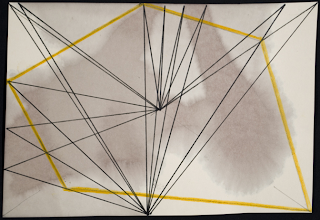 Below, Carrie Moyer in Affinities: Painting in Abstraction, curated by Kate McNamara. This exhibition sparkled with summery slices of brilliant color and thoughtful installation.My phone camera did not capture the show's luminosity. Moyer, Polly Apfelbaum (table in front), Nicole Cherubini (sculpture). The Cherubi was charming--the Apfelbaum like little cakes for the eyes. Shifting gears down the street with Jessica Rohrer, PPOW (their website uses this image as well). Not sure the image can do justice to the strange space that occurs perceptually in Roher's bay window below. Pat Lay, who in addition to sculpture has been making collage tapestries of motherboards and other technological images. Mark Grotjahn's breakout show, passionately and totally painted. A new presence, Celeste Dupuy-Spencer at Museum 52, showing with Nicole Eisenman and Leidy Churchman. Beijing was a whirlwind: two weeks of appointments, galleries and on a fine Sunday morning, a memorable bike ride to Ritan Park. A full hour in flowing traffic through Beijing's rotaries, from our hotel near the view above to Ritan, one of China's oldest parks. Built in 1530 as an altar for ritual sacrifice to the sun god, the park features a mural that combines public art with spiritual devotion in its sumptuously glazed and patterned ceramic tiles. The view above became familiar on the trip. I often sat at this cafe mid-morning over coffee, unable to relinquish the attachment despite the best tea in the world. The view afforded no end of entertainment: a small child bouncing on a huge, green animal toy across the walk, an ancient woman with a cane who stopped to doze on the bench outside and passersby returning home from the night before or hastening to work.